The Knights Close Helmet is from around the 16th century. In the legends of knights in shining armor, the gallant knights wore helmets styled as this! This beautiful actual working replica helm, with Falling Buffe or visor, closely resembles the original snug fitting armet style helmet that became popular throughout England and Scotland during the 16th and 17th century. It afforded protection to the neck as well as the head and face. 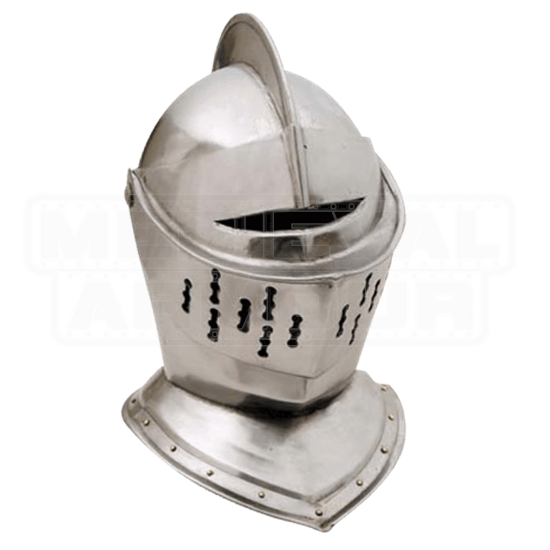 The Knights Close Helmet is hand made of high carbon steel and fully wearable. This helmet is really great! You will definitely need an arming cap as this helm is pretty large. The only negative thing I can think of is there are no straps at the base to keep the helm closed. Otherwise, it's great!